Youth Intermediate Serpent Group – A.K.E.A. This group requires instructor permission to attend. It is designed for youths who have completed the Beginning Groups and are ready to learn more advanced skills. This is a FUN and energetic group that will cover sparring, semi-spontaneous self-defense, and escrima. 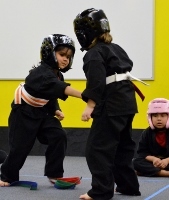 Students will take the skills they already know (kick, punch, block) to the next level. 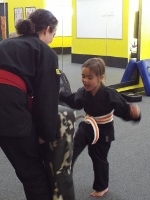 They will learn in an environment that is geared to keep their interests while still focusing on self-discipline, self-respect and self-defense. Students will need their own escrima stick and sparring gear to attend this group.